In 2012, researchers at UC Berkeley released a report showing that so-called “interest rate swaps” were costing the university millions of dollars. Now the Orange County Register has reported that these swaps, pushed by Wall Street bankers, are costing UC $6 million per year and could lose the system up to $136 million over the next several decades. Already, one financial contract at UC Davis was canceled, requiring UC to pay $9 million in termination fees to several banks. According to a just-published report by the Center for Investigative Reporting, the University of California’s $11.2 billion endowment has produced the worst investment returns of any of the colleges with the largest endowment funds in the country over the past decade. In three years, the endowment actually lost money. The Legislative Analyst's Office recommends changes in the state's methods of funding UC and CSU that would, among other things, require students and the state to share cost increases and review capital projects as part of the budgetary process. Sources: Data provided by the universities. 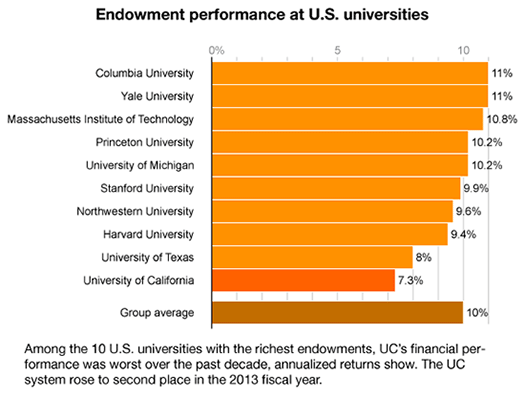 UC data reflects combined performance of University of California general endowment pool plus separate endowments. More than 8,000 UC service workers represented by AFSCME have voted to strike from March 3 to 7. This five-day walkout will be the third strike in the past year. Another unit represented by AFSCME, the 13,000-member patient care technical unit at UC’s teaching hospitals, will also strike in support. Both units have been working without contracts. After pushing negotiations with AFSCME to impasse last year, UC imposed its own employment terms. Members voted by 96% to authorize the strike. Faculty at the University of Illinois, Chicago, staged their own two-day strike last week following more than a year and a half of negotiations with management. “State universities have been turned into businesses, business corporations with a focus only on the bottom line,” said the union’s president.